Here's the thing I didn't like about traditional high chairs. Those latches are awkward. With latches, you need both hands and a lot of patience. I actually went to a local baby store and tried out various high chairs for myself, and what I found was that the latches were frustrating, cumbersome to operate, and generally made everything harder than it had to be. 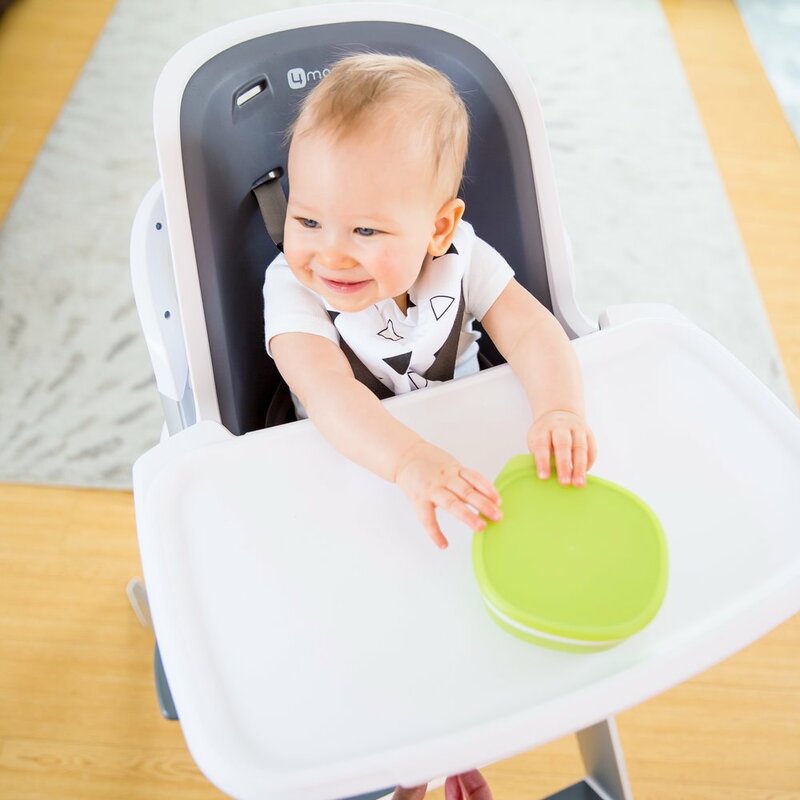 When I discovered the magnetic tray design of the 4moms high chair, I was immediately hooked. It turns out my instincts on what high chair to pick were correct. Now that I'm a mom, my baby and I are practically joined at the hip. I never put him down. I LOVE having him with me at all times, and if I can carry him, I will. With the 4moms high chair design, I can easily snap his high chair tray in and out with one hand, which means I don't have to put him down. It also means I don't have to struggle with those frustrating latches. It only takes seconds to get the high chair set up. With the added benefit of easily adjusting to three heights, I save a lot of time in the day, which is great because time is at a premium for me. In addition to being easy to use, this high chair is super durable. The tray itself is dishwasher safe - just put it on the top rack. The easy to clean, foam seat insert requires just a little soapy water, and it's all clean and ready to go for next time. And the BEST part is that it is magnetic! We have the accompanying bowl that sticks to the tray so baby can’t knock it of the table. The 4moms high chair really is designed perfectly to make life easy for moms. With its easy to use design and equally easy cleanup, 4moms high chair is the best high chair for us! The amount of time saved over traditional high chairs in both use and cleanup has been huge for me. I love the sleek, pretty design - we call it Eukiah’s little space ship! lol. I highly encourage you to give the 4moms high chair a look if you have a baby. It's a winner!